Eric has highlighted his search for new drugs in a video entered into Thinkable’s ‘180 Seconds of Science’ competition, sponsored by the Royal Society of New Zealand. “New Zealand is very special place. Because of its geological history and geographic isolation it has relatively high level of biodiversity,” says Eric. Plant-based drug discovery in New Zealand on Vimeo. Most recently, Eric’s work has focused on compounds extracted from the ongaonga plant – the most exciting plant he has ever worked on. 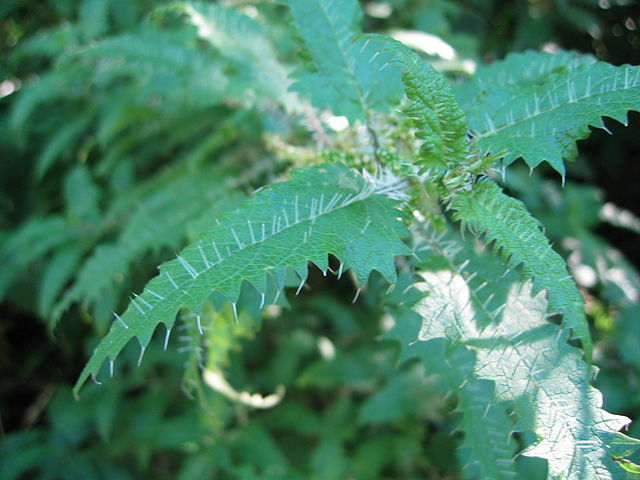 Ironically, this native stinging nettle may contain a new treatment for chronic pain associated with diseases such as diabetes, leprosy, Guillain-Barré syndrome and other autoimmune diseases. Ongaonga (Urtica ferox) is a New Zealand tree nettle. Skin contact with the hairs is very painful. Based at the Nelson Marlborough Institute of Technology, Eric is working with the prestigious US-based Mayo Clinic (where he completed his PhD) to analyse the medicinal properties of the plant extracts and identify possible compounds for further development as medicines. In the video, Rōpata Taylor, General Manager, People and Culture at Wakatu Corporation notes the important role traditional medicine plays in understanding the healing properties of native plants. Landcare Research highlights several traditional medicinal uses of the ongaonga plant, including boiling its bark with kawakawa leaves to be used as a treatment for eczema and venereal disease. “It was this crazy, burning sensation and I thought ‘what the hell?’. What particularly got Buenz’s scientific senses tingling in the bush was not the sting from the poisonous spines of the ongaonga but the numbing aftermath. It’s not common to get such an effect on the nervous system from a substance that is only applied to the skin. 180 Seconds of Science is a competition for Early and Mid-Career Researchers offering them the chance to highlight their research in short videos. The public can vote for their favorite videos online, but be quick – voting closes the 22nd August 2016. Special thanks to Kimberley Collins for highlighting the competition and collecting the New Zealand-based links. Interesting article and hopefully this leads to some helpful treatments. Just wondering what sort of engagement with the government or Maori groups there has been about access rights or benefits that might result from the use of the plant?